Charger is an Enemy machine in Horizon Zero Dawn. 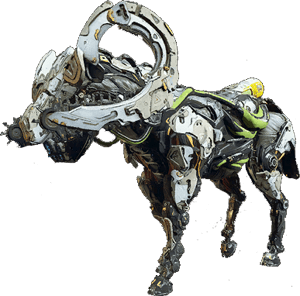 When a threat is detected, these herd machines will actively pursue and attack in numbers. Body: Hard outer casing to protect synthetic muscle and operational systems. Horns: Destroying this component disables the charge attack. I found some in the North Middle Right node on on the map where the desert turns to mountain, their icon is VERY similar to that of long horn.